It all starts with a hot dog. Toss it in a sweet-tasting bolillo roll. Dump some pinto beans, onions, and chopped tomatoes on it, cover it up in guacamole and cotija cheese, then drizzle on some ketchup, mayo, and mustard to finish. Garnish it with a yellow chile. 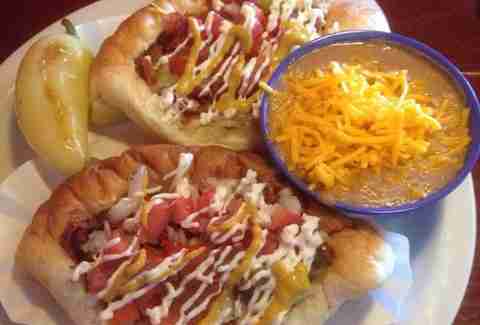 Thus, you have the glorious Sonoran dog. Sometimes you might even be lucky enough to get the dog wrapped in bacon, depending where you go. Originating in Sonora, Mexico around 50 years ago, hence the name, the famed dog (occasionally known as the Mexican hot dog) can be found in Tucson, metro Phoenix, and very few other spots around the Grand Canyon state. You can keep your Chicago dog, Windy City. We got our own. These are some of the best around town. 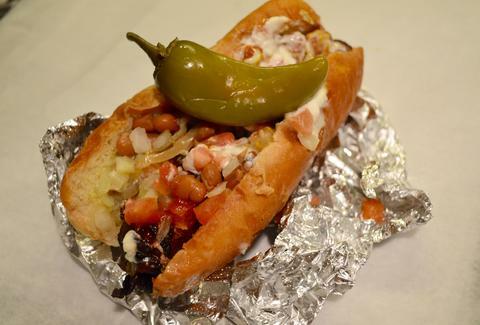 Beans, salsa, and hot dog come together to make what we Phoenicians already know and love, the Sonoran dog. But, the only downside is, you can’t always count on the folks at Micky’s to throw the dog in a bolillo roll; you might get stuck with a plain old bun. Whatever you get, the combination of pinto beans and hot dog is still delicious. And it’s cash only, FYI. You don’t have to take a trip down south to Tucson to get your Sonoran dog fix. The world-famous hot dog joint based in Tucson, El Güero Canelo, opened up shop earlier this year in the West Valley, and we think that the line is worth waiting in. Adam Richman of Man v. Food swears by these things, and he’s got good reason to. The tagline “one bite and you’ll love it” rings true. 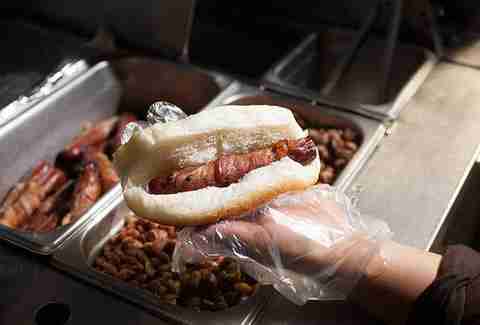 Remembered how we mentioned that you can get your hot dog wrapped in bacon? Dreams really do come true, because you can combine the two at Nogales Hot Dogs. The hot dog slingers at the cart-style parking lot pop-up don’t short you on toppings either, like the wildcard addition, mushrooms. We suggest pairing your Mexican hot dog with a classic glass bottle of Coke or Jarritos. Nogales Hot Dogs accepts cash and card. The family-owned parking lot hot dog stand on the West Side surely impresses. With a mix of salsa, sauces, pinto beans, and crispy bacon their Mexican hot dog comes to life with colorful and vibrant yellow, red, and white sauces on top of a doughy bun. Hours sometimes vary, but you can rest assured you can your Sonoran dog if you show up before 7pm. Cash only. Got a hankering for hot dogs in Old Town Scottsdale? Get to RnR. 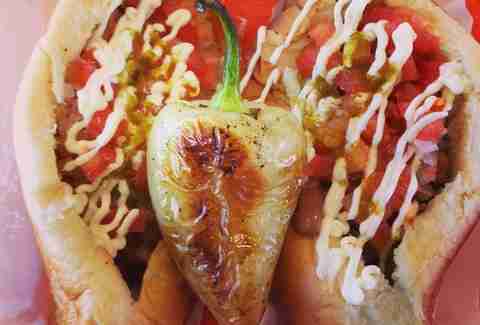 Whether it’s brunch or late night reverse happy hour, you can get your Sonoran Dog fix, here. Pair it with a bloody mary or local craft beer or sip endless mimosas on Sunday while noshing on all the goodness that is the glorious Mexican hot dog. 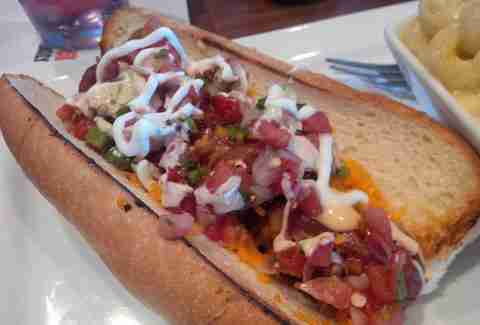 We can’t say the gastro pub does an absolute perfect rendition of the Sonoran Dog, but their dogs rank among the top. With locations in Chandler, San Tan Valley, and Mesa, Moreno’s Mexican Kitchen makes their Sonoran-style dogs available to almost every corner of the east side of the Valley. What some say are “the best” Mexican hot dogs outside of Tucson, these dogs are served alongside a green chile and fries (or beans). This sucker practically takes up an entire plate. But we’re not complaining. Don’t be discouraged. If you’ve got a big appetite you can order more than one; they’ll just give you a bigger plate -- no problem. And the bolillo roll? Don’t get us started. You can get it all, plus a drink for under five bones. If you’re looking for a Sonoran dog done right, and cheap, this is it. This Mexican food truck, parked on Van Buren and 16th St in Central Phoenix, has earned a reputation as having some of the best genuine Mexican street eats in the city, including the Sonoran dog. The menu is all in Spanish, and it’s cash only. Figure it out. Oh, one last thing, La Frontera is the spot for $2 tacos. Forget peanuts and Cracker Jacks, ballpark food today is better than ever before. And Chase field is leading the way in bringing us our favorite non-traditional game time foods. Take your pick from The Draft Room, the park’s craft beer destination, Food Truck Alley, chicken & waffles, burgers, pizza, tamales, and more. Despite the seemingly endless food options, we’re here to talk about Mexican hot dogs. Forget the boring franks, Red Hot Grill, located inside of the stadium, has got piled high Sonoran dogs with all the pickings you could imagine. This gets us thinking, when does baseball season start again? Lauren Topor is a Phoenix writer who’s pretty sure she just started a beef with everyone from Chicago. See what else she’s up to by following her on Twitter and Instagram.